In a pre-draft trade, the Los Angeles Kings have acquired Flyers captain Mike Richards from Philadelphia, in return the Flyers picked up winger Wayne Simmonds and much sought after prospect Brayden Schenn along with a second round draft pick in the 2012 draft. Richards comes to the Kings with the remainder of a 12 year 69 million dollar contract extension that he signed in 2007. The Flyers pick up a less experienced Simmonds who has only been in the league for three years, while freeing up a significant amount of money, Simmonds made $525,000 last season. While bouncing around the AHL and WHL for the majority of last season, Schenn only played 8 games with the Kings acquiring only two assists, but has a lot of hype surrounding him after his dominating performance in last years International Ice Hockey Federation's World Junior Championships. In Richards, 26, the Kings pick up a seasoned veteran, who was drafted in the first round (24th overall) and was captain of the Flyers for the last three seasons. 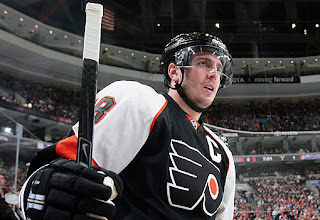 Over the course of his six seasons with the Flyers Richards recorded 349 points (133-216=349), while appearing in 453 regular season games. In 63 playoff games he added 50 points (16-34=50). Simmonds, 22, was selected by the Kings in the 2007 draft in the sixth round (61st overall), played the last three seasons with the Kings grabbing 93 points (39-54=93) with 264 penalty minutes in 240 regular season games. Simmonds also played in every Kings playoff game during the last two seasons. Schenn, 19, has only played nine games with the Kings over the last two seasons, and was selected in the first round (5th overall) in the 2009 draft. The Kings are losing a fan favorite in Simmonds, and perhaps the next big star in Schenn but have gained a lot of grit and leadership in Richards. Not to mention the playoff experience, Richards came just two games away from winning the Stanley Cup with the Flyers two seasons ago. Watch for Richards to make an immediate impact both on the ice and in the locker room for the Kings.